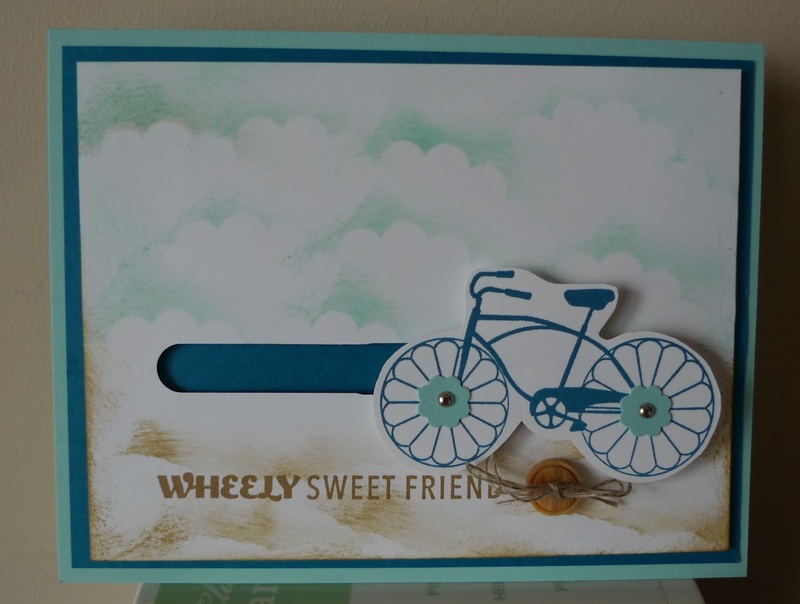 Karina's Kreations: Cycle Celebration Wheely Sweet Card! Cycle Celebration Wheely Sweet Card! I have another stamp set of the month card to share with you. It's a spinner card and I made a video showing you how its made. My card stock colors are Pool Party, Island Indigo and Whisper White. The flower punch for the wheels is part of the Itty Bitty Shapes Punch Pack #118309. I hope you'll try one of these cards or I'll send you one by joining the stamp set of the month group. That is adorable. I hadn't thought of using the bicycle for a spinner card but what a fantastic idea. I can't wait to get my stamp set this month! I have the cards made and I'm just waiting for the stamp sets to come in! I think you'll like this set! I just fixed the video! Sorry it tool so long!